Bright, colorful socks to knit! 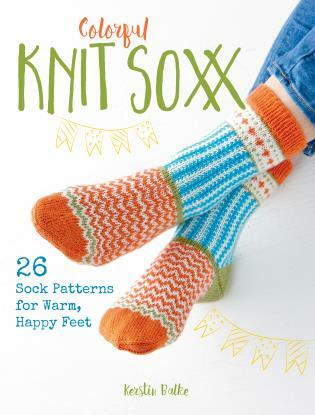 The 26 designs in this book will ramp your sock knitting from ho-hum to WOW! Each pair of socks is a masterpiece of luscious color, but the repeating patterns ensure that the knitting is still relaxing and easy to track. Divided into five color sections--bright, maritime, natural, pastel, and classic retro--there are patterns to please every taste. Wonder what the socks would look like in other colors? Check out the inspirational chapter showing some of the socks knitted in other color schemes, and then choose your own color combinations to try. New to sock knitting? We've got you covered! Explanations of sock knitting techniques--from the anatomy of a sock to how to work the heel and toe--are included, along with illustrations. Your feet will be doing a happy dance every time you wear these beautiful socks you knit yourself! Kerstin Balke learned knitting at the age of six from her grandmother. She has made pullovers, jackets, scarves, hats, and even fine tablecloths over the years, but her true passion is the knitted sock For several years she has been designing her own patterns under the name Stine & Stitch. She lives with her husband and her two daughters between Hamburg and Lübeck, Germany.